Jesus’ command to “be perfect, as your heavenly Father is perfect,” (Matthew 5:48), is not a statement meant to be an eschatalogical finish line because one slip-up equates total failure. Those aiming to cash in their morality chips for eternal life will be tragically disappointed to realize the very thing they’d hoped would get them in (keeping the law) becomes a curse against them (Galatians 3:10). There’s a common misnomer floating around that Christianity is about morals. It’s not. While moral living is often a byproduct of faith in Jesus, it’s not the basis for it. Salvation is not earned by keeping the commandments—the commandments were already kept perfectly on our behalf. 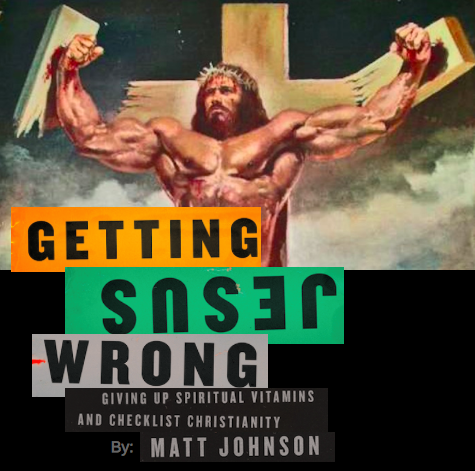 Something in us doesn’t like Jesus objectively fulfilling the law on our behalf. Instead, human hearts prefer the symbol of the upward progressing faith journey as the vehicle for achieving our own personal holiness. But this “try harder” beliefinevitably results in pride—the worst sin of all. The law does not, and cannot, produce what it demands. A road sign only informs drivers of the law but knowledge doesn’t produce skillful, courteous driving. Put another way, the law is a mirror that reflects back who we really are. If the law is a "Who’s Naughty or Nice" detector, that would mean, by default, the upright citizens helping grandmas across the street, rescuing kitties out of trees, and sending their IRS auditor greeting cards would need less empowering grace, since they’re already doing the right thing. But there’s never a time that we need less empowering grace. In light of Romans 3, defining the law as a personal moral progression barometer is not only offensive, its absurd. First, we need someone perfect to stand in our plac—otherwise, we’re cooked. Second, we need empowering grace every single day. Rather than seeing sanctification as a linear progression from bad to better, the Christian life is more accurately described circularly; we return again and again to the cross. And Jesus, the perfect law-keeper, extends mercy, forgiveness, and Spirit-empowered grace for obedience. God’s law is good, holy, and perfect. But a law-driven life devoid of the Good News is miserable. The naked demand, “if you obey, then you will be rewarded,” will not work in-and-of-itself to empower obedience. Instead, what we really need is a "because/therefore”paradigm. Because you are in Christ, because you are reconciled to the Father, because your sins are forgiven, therefore, go and [insert biblical command here]. Rather than seeing sanctification as a linear progression from bad to better, the Christian life is more accurately described circularly; we return again and again to the cross. When the law has rightly had its way with sinners, it will drive them to despair of their inability. When someone feels the death blow of the law, don’t flinch! Offer the good news of Christ’s imputed righteousness immediately! While the law justly pronounces us guilty, increases sin, and pronounces us dead (Paul’s words, not mine), the New Covenant sets us free from the condemnation of the law, Jesus stands in our place, and the Spirit writes the law on our hearts. Not only are we seen as righteous because of Christ when we fail, we have a faithful high priest who understands our weakness and has gladly endured the cross for our sake. This is good news!